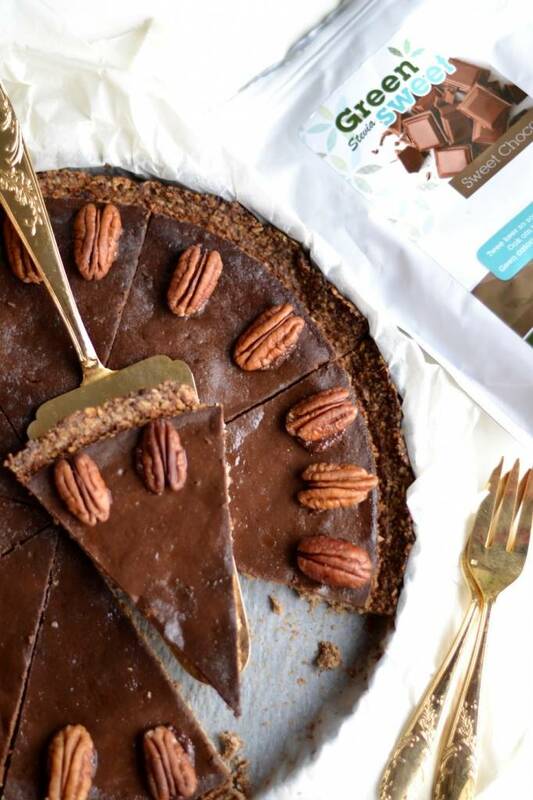 What a delicious recipe from Manon from Vegan Flavors, in which she has processed Greensweet Sweet Chocolate and Greensweet liquid stevia vanilla. I fixed this with homemade chocolate spread . Preheat the oven to 180 degrees and cover a baking tray and cake pan (23 cm) with baking paper. Place the oatmeal and pecans on the coated baking tray and place in the preheated oven for about 10 minutes. Put the roasted oatmeal and pecans in the food processor together with the coconut oil, salt and Greensweet Sweet chocolate (first start with half). If you have a sticky mixture, you can taste it. Add the other half of the Greensweet Sweet chocolate and season to taste with some Greensweet liquid stevia vanilla and mix. Is your dough too dry? Then add some moisture. This can be done with water or a vegetable milk. Make a ball and wrap it in cling film and place in the refrigerator for 20 minutes. Clean the food processor well. Add the pumpkin puree, silken tofu and spices and mix into an even mixture. Leave to stand for a moment. Melt the dark chocolate au ban marie and when it is completely melted, add it to your pumpkin puree. Mix well together. Little by little you add the Greensweet Sweet chocolate. Keep on tasting. I've added everything, but maybe you want it a bit less sweet or sweet, then you use more Greensweet Sweet chocolate. Remove your dough ball from the refrigerator and press it on the bottom of your cake base. Press firmly. Put it in the preheated oven for about 15 minutes. Then let it cool down so that the soil can harden out. Pour your chocolate mixture on the bottom of the cake and put in the oven for about 50-60 minutes. Does your picker come out dry? Then your cake is ready. Let it cool down gradually. I do this by leaving the cake in the oven with the door ajar. When the cake is well cooled, you can do the garnishing. I used some extra pecans, but fresh raspberries are also delicious! You can stick the pecans as a circle at the end with some homemade chocolate spread. There are many ways to finish the cake. Use your own creativity. Keep the cake in the refrigerator. Do you have any documents left? You can also freeze a tip for a later moment.